After the whole “why?” ordeal has been resolved, folks then typically ask me how I am enjoying New Jersey. Sometimes this question is sincere, others sarcastic. (I’ll just assume then that you’d like to know, too.) I almost inevitably respond with some mixture of seriousness and whimsy: “I quite like New Jersey. The seasons are interesting, and there’s water.” I usually get at least a chuckle, sometimes more when my timing is on point. Watching my beloved California become regularly engulfed in flames, larger and deadlier each year, I am thinking more about water than ever before. Don’t get me wrong—I grew up in drought-stricken Southern California. I thought about water a lot. I’m as familiar with household water conservation efforts as I am the absurd, elitist water policies (aptly, “water wars”) that my state has enacted in order to make a metropolis like Los Angeles even possible in what should be a “desert.” And now, somehow, I find myself in what I would consider a “water-abundant” place. To be sure, New Jersey is not ‘untouched’ by climate change—the weather is noticeably more erratic this year than even the last two that I’ve lived here, not to mention events like Superstorm Sandy which tragically affirm that climate change is here and growing. Even so, New Jersey certainly has more water than I’ve encountered in the past. It’s overwhelming—and beautiful. These days I’ve been hanging out with a lot of what I would refer to as old-timers; spending time in progressive, mainline churches—with their rapidly aging demographics—will do this to you. The folks from my little UCC church are not excluded from this fact of church life. I cherish these friends’ wise perspectives, their caring and careful dispositions, and their embrace of tradition. It’s particularly the latter of these that has been a central reason I love them, as well as a central reason I struggle to love them. They are insistent in their reminders to me about the value of tradition and its grounding ties to our shared pasts; and as a young person, I am insistent in pointing out how this tradition doesn’t “land” with people my age, particularly by those who recognize that portions of this tradition have been (and continue to be) used in racist, homophobic, earth-destroying, or otherwise violent ways. (Sometimes I am able to do this patiently. Other times, I need a bit more grace.) And so, we dance on—together. It’s probably no coincidence that I became involved in a more traditional denomination at the same time as I moved to a geographical region with “real” seasons. (While the UCC is anything but traditional, any denomination having to do with a “lectionary” is traditional to someone who grew up in evangelical circles; while New Jersey’s seasons may be mild to someone from, say, Minnesota, any place with something even remotely resembling four somewhat distinguishable parts of the year is “real” to someone who grew up in Southern California.) I think it’s quite related that I started to find meaning in the cyclical nature of seasons as I became immersed in the cycles of the Christian church. Seasons are liturgical; liturgies are seasons. They cycle; they remind. I’ve come to think of liturgy and seasons as intimately interconnected. I need winter to remind me what spring smells like on that first relatively warm day as much as I do the anguish of Holy Saturday to know the inexplicable mystery of Resurrection Sunday. We might then consider liturgy ecclesial and climatic, theological and geological. But given the impending—the very much already-here—woes of climate change, what happens when the rain stops? when it comes in unstoppable floods and rising tides? Or, what might happen if Advent simply fails to appear and there is no baby Jesus of Nazareth? This is serious stuff. What happens when liturgy fails? when it breaks? when it just up-and-leaves? This may, in part, constitute a failure. But this broken cycle may also constitute an opportunity for creative emergence, like a seedling growing through a crack in the sidewalk. To persist, to resist, will then require careful discernment and immense creativity. When the well dries up or when the spirit of Pentecost seems to head in another direction, creativity might be our only option. In speaking of “creativity,” I do not mean “genius” or “artistry,” necessarily; I simply mean: adequate or sufficient creativity to faithfully live in communion with Earth. These moments may demand creativity to devise methods for redistributing resources as they become scarce; they may call us to follow the wisdom of our youth who see and know the world differently, perhaps more truthfully; they may suggest that our constructed liturgies of agribusiness, transportation, even institutional churches might have to be demolished if we are to survive and, daringly, thrive. To be sure, referring to this as a moment for creativity is not to say that this—any of this—is going to be any fun at all. It’s not. Especially for those who are already made poor, marginalized, or otherwise oppressed by the relentless tides of capitalism, racism, homophobia, xenophobia, and beyond. The failure of our liturgies—whether ecclesiological or geological—might just be an invitation to revolutionize, perhaps overthrow, the systems that reify or otherwise do not challenge violence, which may very well include the church as we know it. But then again, allowing ourselves to think this way, this terrifying and liberating way, might put us nearer to the radical spring ceaselessly emerging from Jesus of Nazareth—revolutionary of the political, agricultural, and theological, and flipper of tables. Bio: O’neil Van Horn is a scholar-activist currently working on a PhD in Philosophical and Theological Studies in Religion at Drew University. 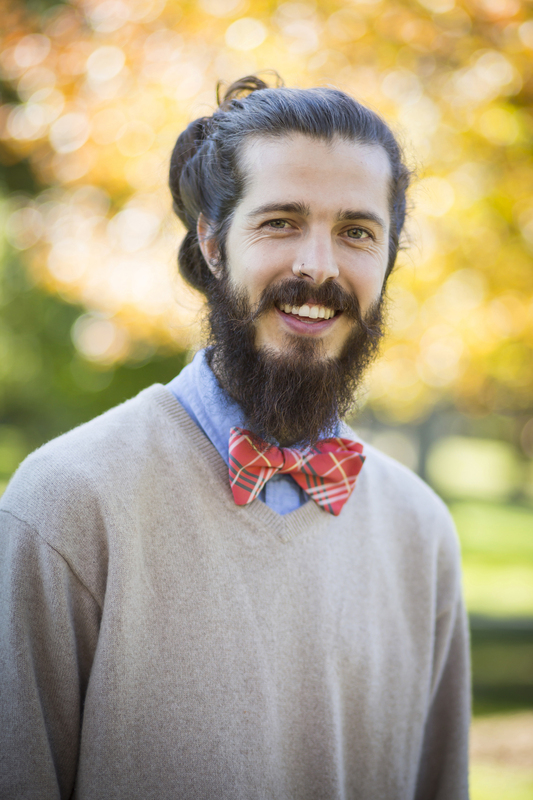 His work primarily focuses on crafting ecotheologies that encourage sustainable living. When he’s not buried in books, he can be found rock climbing, playing guitar, or working on organic farms.